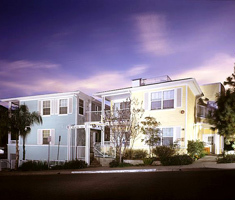 Beacon Hill is a 14-unit, USDA subsidized, affordable apartment community located in Avalon on Catalina Island for people 62 and over. The property is currently accepting applications for the waiting list. This property does not accept Housing Choice (Section 8) vouchers. The property features one bedroom units and a spacious community room with a fireplace and computer. The community room is frequently used for monthly parties and holiday celebrations. Card clubs, quilting classes and other special events are routinely available for the seniors to enjoy. Beacon Hill has a wonderful courtyard where residents can read and relax. Garage parking and laundry facilities are also provided. Beacon Hill is located one block from the downtown area with easy access to the grocery store, post office, bank, restaurants and retail shops.